This is the sharpest image ever taken by ALMA — sharper than is routinely achieved in visible light with the NASA/ESA Hubble Space Telescope. It shows the protoplanetary disc surrounding the young star HL Tauri. 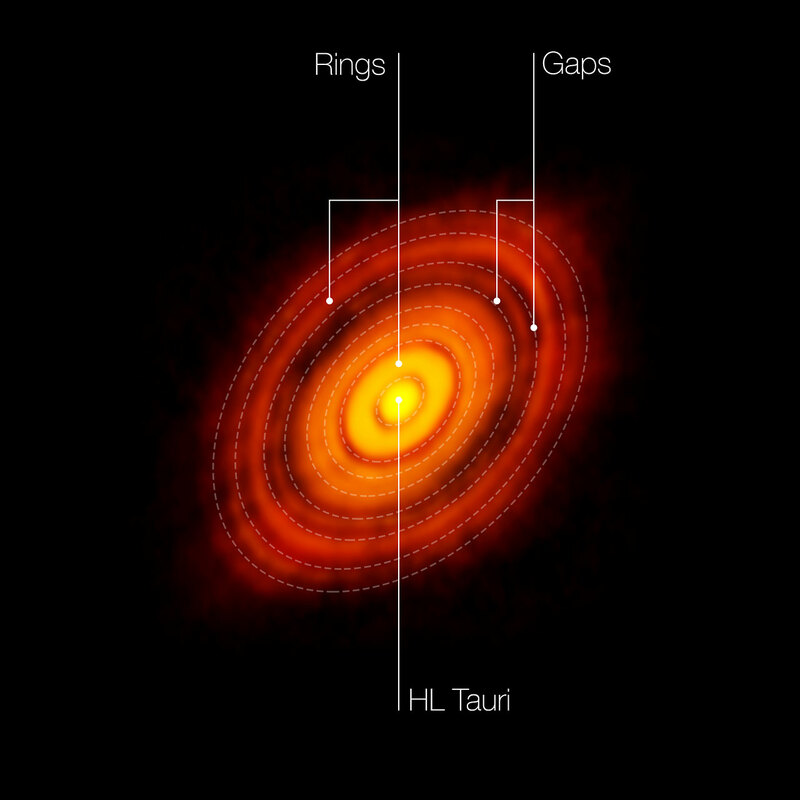 The observations reveal substructures within the disc that have never been seen before and even show the possible positions of planets forming in the dark patches within the system.In this picture the features seen in the HL Tauri system are labelled. This new image from ALMA, the Atacama Large Millimeter/submillimeter Array, reveals extraordinarily fine detail that has never been seen before in the planet-forming disc around a young star. These are the first observations that have used ALMA in its near-final configuration and the sharpest pictures ever made at submillimetre wavelengths. The new results are an enormous step forward in the observation of how protoplanetary discs develop and how planets form…. This entry was posted in ASTRONOMY, ASTROPHYSICS and tagged ALMA. Bookmark the permalink. In a Multiverse, What Are the Odds?